Forward Matthew Tkachuk didn't hesitate when asked what he felt stood out most about his U.S. Hockey Hall of Fame father, Keith Tkachuk, during his playing days. "His leadership and competitiveness for sure," the younger Tkachuk said. "He would have no problem whacking a guy, sticking up for a teammate or just being vocal. Throughout his career it seemed there was never a time he didn't have a letter on his jersey. "I know [having a letter] doesn't mean everything, but he's just a great leader." The elder Tkachuk served as a captain or alternate captain in the NHL for 15 of his 18 seasons in the League, making his NHL debut with the Winnipeg Jets as a 19-year-old and being named captain of the team in his second full season in 1993-94. He was also a captain or an alternate on four different occasions while representing the United States in international competition. Matthew Tkachuk (6-foot-1, 195 pounds), who plays left wing, appears to be a chip off the old block. 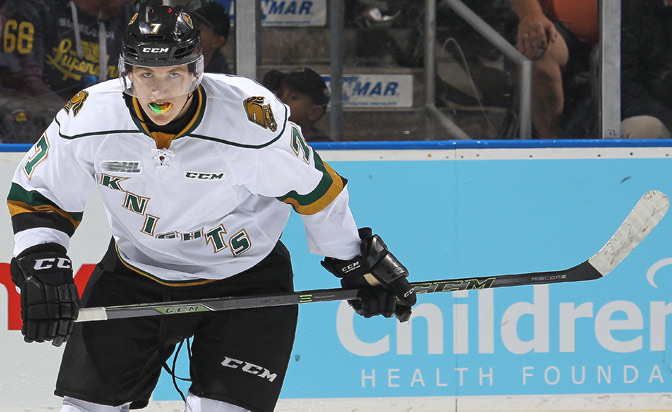 Tkachuk, a rookie with the London Knights in the Ontario Hockey League this season, is projected to be a first-round pick in the 2016 NHL Draft at First Niagara Center in Buffalo, N.Y., on June 24, 2016. The St. Louis, Mo., native might even be drafted higher than dad, who was chosen No. 19 by the Jets in the 1990 draft. Tkachuk is an A-rated skater on NHL Central Scouting's September players to watch list. "The two biggest aspects to becoming an NHL player are leadership and competitiveness," he said. "You have to be liked by your teammates, have to be a good teammate and have to be the hardest worker. You want to have the will to win more than the other guy and ultimately it comes down to you. What will you do to get to the next level?" Tkachuk is proving he'll do whatever it takes. His spirited play and dominating effort in front of the opposing net during the United States National Junior Evaluation Camp in Lake Placid, N.Y., in August left a lasting impression on the entire U.S. managerial team. "He looked like his old man out there," U.S. national junior coach Ron Wilson said. "He has a nose for the net and fights and claws to get there; he's tenacious, just like his dad." Jim Johannson, who serves as general manager for the U.S. national junior team, agreed. "He's got a wonderful game down low," Johannson said. "He's an agitator and a guy who's at the net, but who also has a really good stick and good hands as a scorer and playmaker. He also plays well in traffic and knows how to battle below the circles to create offensive opportunities." Tkachuk had 38 goals, including five game-winners, as well as 95 points and 119 penalty minutes for the United States Under-18 National Team Development Program in 2014-15. As a rookie with the Knights this season, he has three goals and 12 points in seven games. "He loves the front of the net and believes he can score goals by tips, screens and rebounds; there's not much hesitation," NTDP coach Don Granato said. Having a chance to possibly represent his country at the 2016 World Junior Championship in Finland from Dec. 26, 2015, through Jan. 5, 2016, is something Tkachuk has been waiting for. He finished with four goals and seven points in five exhibition games at the U.S. evaluation camp in August and hopes to carry that over with the Knights this season. Tkachuk, who had a scholarship offer to the University of Notre Dame, opted to take his talents to London for coach Dale Hunter instead. "I talked to a lot of past players that went to London and the track record speaks for itself," Tkachuk said. "I'm a kid who loves hockey and I want to play all the time. I love their game schedule and how much they play. The tradition of winning is great, so to me it was a slam dunk to not only play for the team but knowing one of the best coaches in junior hockey is there." Tkachuk played a vital role for the gold medal-winning effort by the United States at the 2015 IIHF World Under-18 Championship in Switzerland, scoring two goals and 12 points in seven games. He also ranked second on the team with 40 shots on goal on a line with center Auston Matthews and right wing Jack Roslovic. Matthews is the front-runner to go No. 1 in the 2016 draft, and Roslovic was taken No. 25 by the Winnipeg Jets in the 2015 draft. "Tkachuk is a smart hockey player," New Jersey Devils head amateur scout Paul Castron said. "He's not the fastest guy out there, but he knows where to go and is willing to go to the net where a lot of guys don't go. He pays the price to score." Danton Cole, who serves as an associate coach for the U.S. national junior team, likes what he sees in Tkachuk at this stage of his career. He believes the 17-year-old left-handed shot will gradually improve as the level of competition gets even better. "It took him a few days to get into the flow of things at evaluation camp (in August), and that isn't unusual for the young guys, but he takes the puck to the net, plays with a good edge, skates well and is easy to play with," Cole said. "He's not only a goal scorer but he makes a lot of good passes and does a lot of the small things on the ice. He'll deflect, throw a pick and backcheck really well." Tkachuk impressed U.S. Hockey Hall of Fame member Jeremy Roenick, who served as his coach at the CCM/USA Hockey All-American Top Prospects Game on Sept. 24 in Buffalo. Tkachuk had one goal and two assists in the game. "His compete level and intelligence really stood out," Roenick said. "If you watch him, he plays a lot like Keith Tkachuk. He's not the fastest, but because of his hockey sense he puts himself in good position. That's engrained in his blood from dad. "It's going to be nice to watch him progress in London. He'll get an opportunity to improve as a player and it wouldn't surprise me if he goes early in the draft."